You want to encourage your child to move away from the TV and the video games and enjoy some fresh air and exercise. Grab a ball and head to the back yard, and you can all hone your kicking skills. Enlist the entire family to join the fun -- the more, the merrier. Even toddlers and preschoolers can participate in kicking games. They’ll practice eye-hand coordination and develop gross motor skills. Put on your sneakers and let the games begin. This is a variation on the game of bowling. Set up 10 cones in the yard to represent 10 bowling pins. Designate a boundary line suitable for your child’s ability level. She kicks the ball from the boundary line, trying to knock over the “pins.” She gets three kicks and scores one point for each cone that she knocks down. Family members or friends can set up pins and keep score. Rotate positions so everyone gets a turn to kick. After 10 rounds, the highest scorer wins. Draw a circle on a large sheet of poster paper. Draw another, smaller circle inside the first one. Write “5 points” on the large circle and “10 points” on the small circle. Tape the paper on a wall in an outside area. Depending on your child’s ability level, designate a starting point. He tries to kick the ball and hit the 5 and 10 point targets. Keep track of the points he scores. If more than one child participates, give each child five turns. Set cones in random places in your back yard. Give your child a large ball and time him as he kicks the ball and knocks over the cones. Record the time. Play the game again to see if he can beat his time. If you have a group, each child gets a ball, and they all work as a team to knock down the cones. This game works best with at least four players. Three of the children form a large triangle, and one child stands in the middle area. 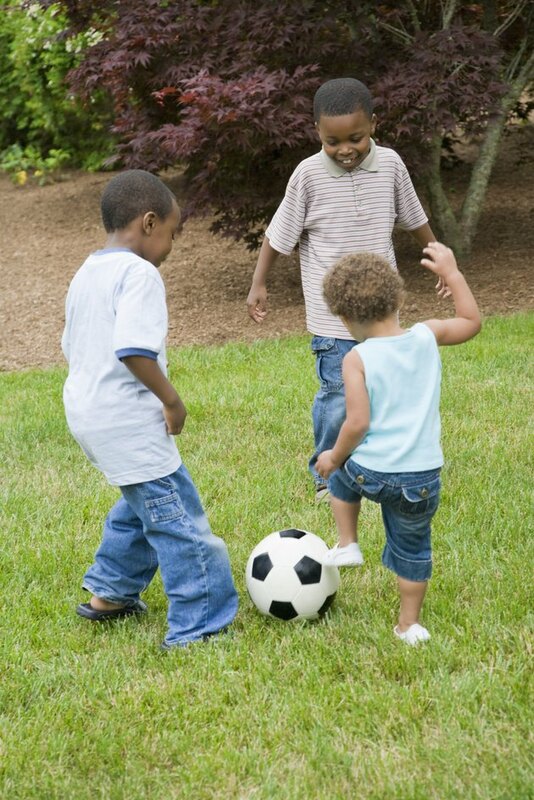 The three outside children kick a large ball to one another, trying to keep it away from the “monkey in the middle.” The child in the middle tries to intercept the kicks. If she does, the last person to touch the ball takes the center spot. You can adapt this game to suit your child’s age. One or more children can play. Choose a starting point -- your child initiates his kicks from that spot. The object is to kick a large ball to various places in the yard. Assign point values beforehand to each destination. Shorter distances result in fewer points. Keep track of the points your child scores in 10 minutes. If more than one child plays, keep track of each child’s score.